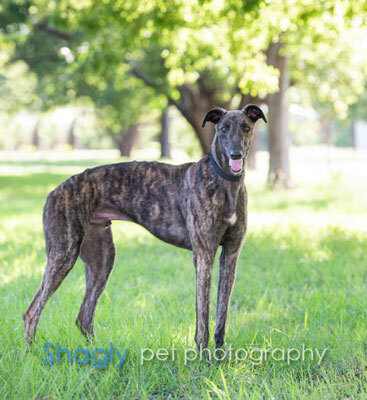 Stubbs, is a 1 ½ year old unregistered brindle male born May 31, 2017. His sire is Pat C. Clement, and his dam is You Belong To Me. Stubbs, his name indicates, has a docked tail from his puppyhood. He showed no desire to join others at the race track, so he is looking for his forever home. Stubbs has decided that he shouldn't live with cats; it is not known about other small animals at this time. Introducing Stubbs, the dog who's never met a stranger and does his best get any pair of hands to pet him. When he's not soliciting for ear rubs and head scratches, he's busy playing with toys. Being a young pup, he does have high levels of energy, and he's learning how to just hang out when the other hounds and humans are doing the same. Stubbs quickly mastered the art of living in a house. He's curious, intelligent and should be trainable. He enjoys being outside in the yard or taking a walk; he has nice leash manners. 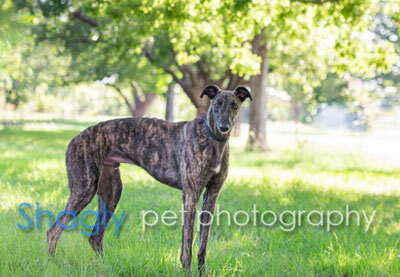 Stubbs' dark brindle markings are striking and his stubby tail is a little wand that he happily wags. Warning: if you stare too long into his deep, dark eyes, you'll be compelled to stop what you're doing and give him love.